This pop filter is easily attached to your microphone stand. And protects your recordings from picking up vocal plosives which could otherwise cause popping on your recordings. 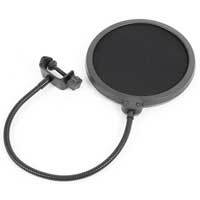 The flexible gooseneck mean you can accurately position the pop filter in front of any mic easily.